After Last Week’s Hiccup, Texan Aims for Semifinals – and Beyond! May 29, 2014 -- As a Texan and an outdoorsman, Steve Torrence is more familiar than most with the philosophy of “getting back on the horse that threw you.” Simply stated, it means attempting the same challenging action after a failure. In Torrence’s case, it means returning to championship form in this week’s 45th annual Toyota Summernationals after an unexpected hiccup sent him to the sideline in the very first round of last week’s Kansas Nationals. Now, on an Old Bridge Township Raceway Park track on which he enjoyed his best overall day as a pro, the 31-year-old Texan hopes to reclaim the monotony that carried him to the semifinal round in six of the season’s first seven races. A former NHRA World Champion in the Top Alcohol Dragster class (2005) and a four-time Mello Yello tour winner since moving up to Top Fuel, Torrence has had days on which his car has been dominant and days when his driving was impeccable. However, few have managed to merge the two like Torrence and his Capco Contractors team did en route to winning the 2012 Summernationals. It’s a level of perfection on which they will focus starting with Friday’s first qualifying session. Although he fell from third to fifth in points after the mechanical failure that left his 10,000 horsepower dragster stranded at mid-track in an unfortunate first round at Topeka, Kan., the second degree black belt (in taekwondo) knows that a return to his earlier form likely will send him right back up the ladder. He comes into the season’s ninth race just 24 points out of third place, little more than one racing round and, even though drag racing is a “what have you done for me lately” sport, Torrence can’t help but recall his 2012 Summernationals victory. For one thing, the cancer survivor left the starting line ahead of his opponent in every round of racing. His best reaction time of the day was .046 of a second against seven-time series champion Tony Schumacher, whom he beat by an almost imperceptible .001 of a second. In fact, he won two races by that narrow margin, both on hole shots. His “biggest” margin of victory was .082 of a second in a first round conquest of Bob Vandergriff Jr. He won the next two rounds by .001 and then beat Brandon Bernstein by .018 in the final. Nevertheless, his reaction time advantage would have made no difference without a competitive race car, which is exactly what crew chief Richard Hogan gave him. 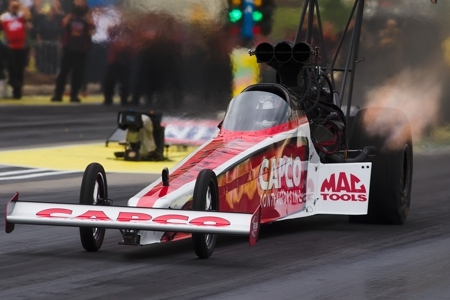 After qualifying at 3.759 seconds, second quickest 1,000 foot time of Torrence’s career, the Capco hybrid ran 3.808, 3.838, 3.814 and 3.800 for the victory. It is that kind of high end consistency the team is hoping to achieve again this week in a race that, on Sunday, will be televised live from 3-6 p.m., Texas time.